There is this long journey ahead and you have got yourself into your car. The plan is simple – stream your favorite playlist from the shiny new Galaxy S10 to the car speakers so that you can relish some quality time while driving. But hey! 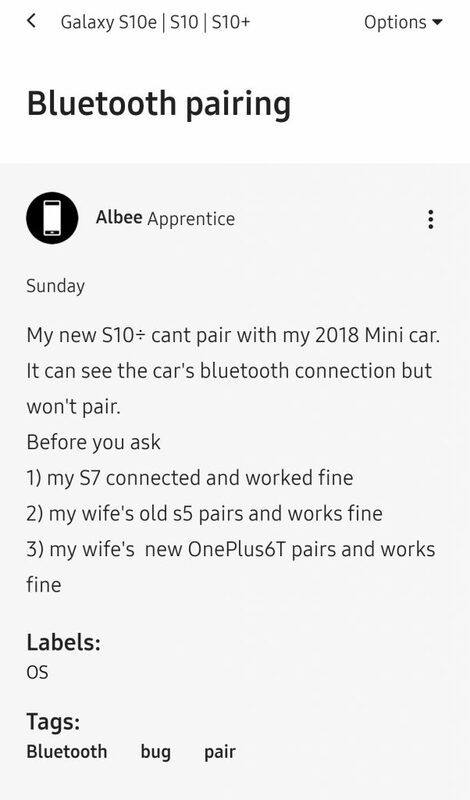 The phone can’t even pair with your car. After tons of nitpicking, it may connect for a while. But the music pauses abruptly and/or the phone frequently disconnects from the Bluetooth speaker. I do not want to see myself as a director of this worst cyberpunk horror movie. But as you can see, several users across the internet are reporting about similar hiccups they are facing with their brand new Samsung Galaxy S10. Hi all, Took delivery of my new s10 plus yesterday and so far so good. Tried to connect it via blue tooth to my car and it finds the car no problem, click on pair and it says “unable to pair, check setting to this device”. Any idea what I’m missing? Little bit lost on this and not sure if it’s just me but hoping someone can help or point me somewhere. I have a s10+ UK edition. And a Samsung galaxy watch. When I connect the phone to the car the audio is low quality and hisses a lot. When I put the watch into plane mode. Cutting it off from the phone. All is normal. Have never seen this happen before. Any ideas? The pairing issue is not limited to cars, but third party Bluetooth headsets and other peripherals are also among the victims. I’m afraid that as this phone has only just been released, our Product Team haven’t been able to adapt the technology for our cars yet. I’m confident that this will happen in the near future, but I’m afraid I don’t have a definitive time frame for this, and there isn’t a software update that can be applied right now. The Galaxy S10 features a Bluetooth 5.0 compliant chip, same as S9/S8. They automatically fall back to lower version profiles if the other device (in this case, the receiver) does not support a particular feature. People came up with different ‘workarounds’ to resolve the glitches. The list includes using third party app to force pairing, changing the AVRCP profile as well as voodoo magics. had same problem with audi q7. Finally got it to work. I had the phone on, opened settings, made sure blue tooth and phone visibility was on – started the car – then went through procedure to pair – worked perfectly. I think it was the order of having phone on and ready before starting the car that worked. I was out in the open, not in the garage or next to a building (if that mattered). Good luck. Another related glitch is the frequent pauses, especially when the screen is turned off. I get quick blips every few minutes when playing through Android Auto. Doesn't matter of the media is local on the device or streaming. Usually lasts less than a second. BT 5.0 SoundCore headphones working OK however. I’m having the same issue with my S10+, when I’m listening to music through aux with spotify, it randomly pauses and when I turn the screen back on it continues. I’m sure it’s a software issue even after I updated it. As you can see, this bug may trigger even on wired mode as well. 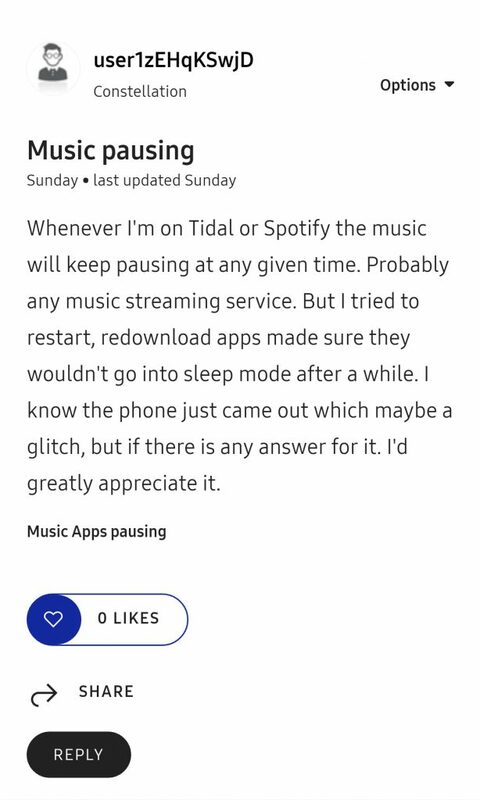 It seems that the OS is forcibly suspending the BT connection along with the streaming app (for example, Spotify), which results in the intermittent pause. 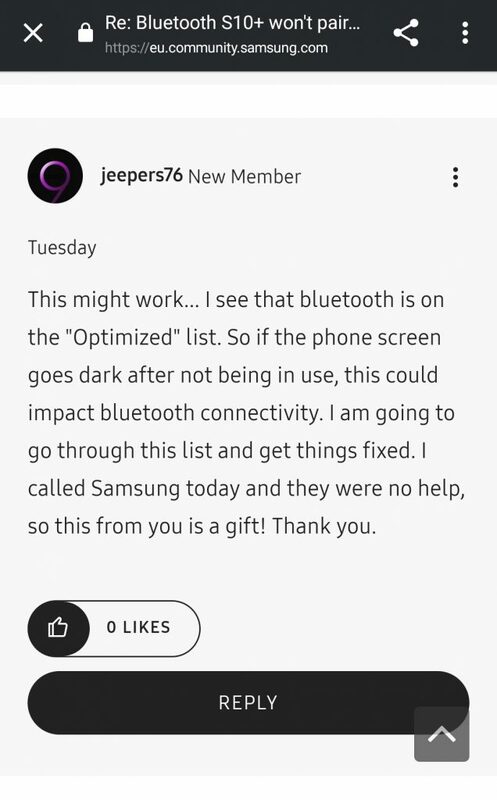 I pre-ordered my galaxy s10 (which came with free galaxy buds) and there seems to be a bluetooth issue. Each time I connect to a bluetooth source, either earphones or car, the bluetooth keeps disconnecting within 15 seconds when the phones screen turns off, and resumes when the device’s screen is turned back on. I also had a frustrating experience at the gym when my galaxy buds kept disconnecting during my workout. THIS PROBLEM NEEDS ATTENTION !!! 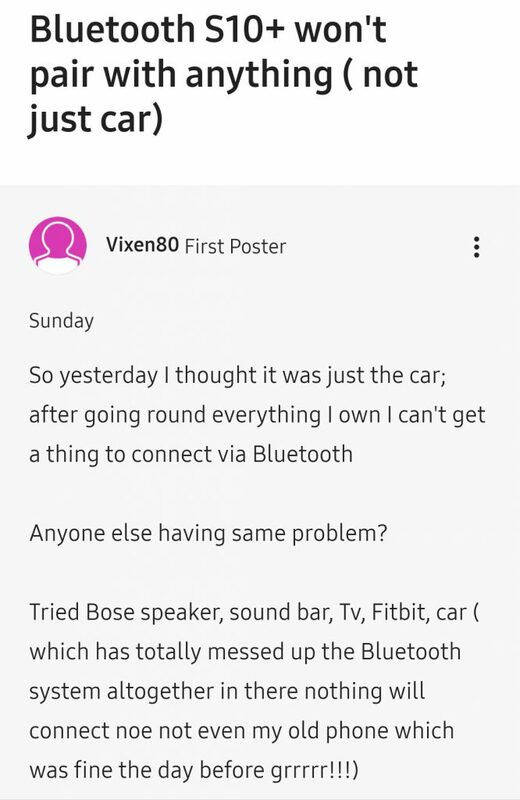 Comment from discussion groot95’s comment from discussion "So how many people are experiencing Bluetooth problems? (Car pairing)". Even Samsung’s own Galaxy Buds are facing periodic cutouts, when paired with Galaxy S10. Yes, it happened after about 2 hours with Galaxy Buds once. Fortunately, whitelisting the apps from automatic battery optimization seems to solve the issue. 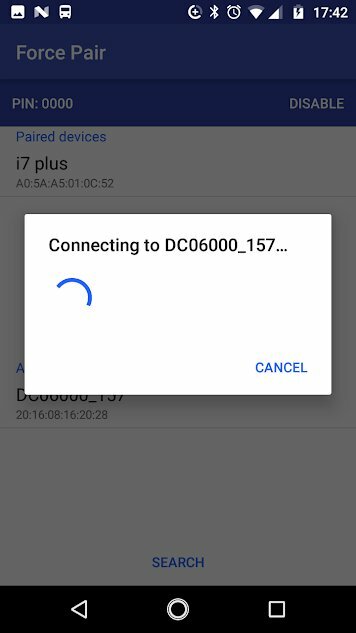 The solution seems to be applicable for Bluetooth connection drop issues as well. Samsung already rolled out the day-one patch to the Galaxy S10 lineup, which claimed to bring camera stability and fingerprint sensor improvements. Hopefully they will eventually patch these pesky bugs via future OTA updates. Are you guys facing the glitches mentioned above in your Galaxy S10? Do let us know. Samsung has pushed out a new update for Galaxy Buds. Change log says the update improves Bluetooth stability among other things. User reports suggest the update has fixed Bluetooth issues for some, but many are still facing problems. What’s your experience after the update? Let us know in the comments section below. 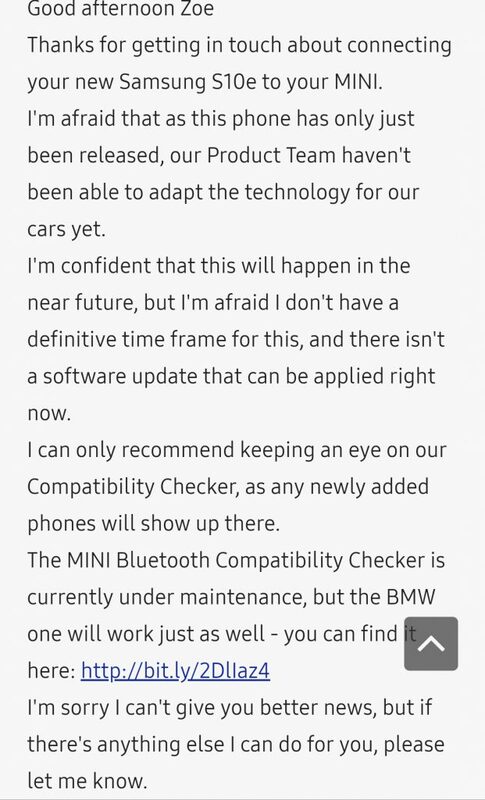 A Samsung Moderator confirmed that the developers were well aware of these Bluetooth issues. We’ve let our developers know about this one. They’ve got back to us today, and advised that as there’s a range of Bluetooth issues/symptoms going on, they want to more closely examine each one individually so they can produce a fix for you as quickly as possible. They need more user feedback to identify the bug(s). Warning: Not a April Fool joke! Samsung has posted a knowledge base article regarding the bug. They are indeed aware of the glitch, and share an uncanny solution besides the typical ‘reset network settings’ advice. For proper Bluetooth pairing, it is advisable to use your vehicle to search and pair with your Mobile Device rather than the reverse way.